Schulz told delegates that he wanted EU member states to sign off on a “constitutional treaty” that committed the bloc to take steps towards a federal Europe – a proposal likely to be met with some resistance from Merkel and other EU leaders. Last year, the then French Prime Minister, Manuel Valls, called for a militaristic United States of Europe (see ‘French Prime Minister Argues For United States Of Europe, With Its Own Military’). What Martin Schulz, Manuel Valls, and other have called for will one day lead to the above prophesied reorganizations–and we are likely to see other reorganizations prior to that. 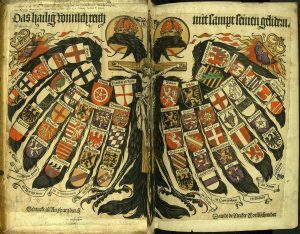 This was the Roman Catholic bid to resurrect the so-called “HOLY ROMAN EMPIRE” ! And PROPHECY says they will succeed! … At the psychological time, the pope will step in … Thru this political movement, he will UNIFY … nations in Europe. It will be a “The UNITED STATES OF EUROPE,” but that probably will never become its official name. (Armstrong HW. Now It Can Be Told…The Plain Truth, December 1948, pp. 2,5). “O Assyrian, the rod of MINE anger, and the staff in their hand is MINE indignation, I WILL SEND HIM against an hypocritical nation, and against the people of my wrath (rebellious Israel) will I give him a charge (command), to take the spoil, and to take the prey, and to tread them down like the mire of the streets” (Isa. 10:5,6). Yes, God is going to rake the nation of Germany as the head of a United Europe into his hand as a club to punish the nations of Israel for their rebellion against Him! Howbeit he meanth not so, neither does his heart think so; but it is in his heart to destroy and cut off nations not a few” (vs. 7). Germany, those living in Germany, even the German government, may not yet know that they are going to join in a treaty with the Russians to destroy the United States and bring it to its knees-it is not in his “heart” to think so, but on the other hand it IS in his “heart” to destroy-the very characteristic of the Assyrian, the modern German, is a harsh, cruel, iron, dedication to militarism and destruction! This is just the kind of nation God needs to use as a rod in His hand to punish His people! Does this then mean that the Germans at the head of a United Europe do have a spiritual mission to perform? Does this mean that they are right in claiming to be the “Defenders of the West” and the champions of Christianity!? No! A German-dominated European military is being forged. The Bible shows that a German-dominated power will destroy (Isaiah 10:5-12). The Bible also tells of the King of Assyria being involved in doing so (Isaiah 10:13-14). 39 Thus he shall act against the strongest fortresses with a foreign god, which he shall acknowledge, and advance its glory; and he shall cause them to rule over many, and divide the land for gain. In the 21st century, the strongest fortresses belong to the USA, and to a lessor degree, its Anglo-Saxon descended allies. The King of Assyria and the King of the North are references to the same power. A power that will destroy the USA and cause its Anglo-Saxon descended allies to also be taken over (see also Will the Anglo-Saxon Nations be Divided and Have People Taken as Slaves?). The Bible teaches that a European Beast power is coming (Revelation 17:12-13; see also Must the Ten Kings of Revelation 17:12 Rule over Ten Currently Existing Nations?). Martin Schulz, Manuel Valls, Jean-Claude Juncker, and others are pushing for a unified Europe. Change is happening with Europe. Brexit and US President Donald Trump are factors in that. This entry was posted on Thursday, December 7th, 2017 at 4:00 pm	and is filed under Prophecy, WCG News. German warns against German authoritarianism; Ivanka Trump jeered in Berlin. ‘Breathing New Life Into The Old Phoenix’ in Europe? Donald Trump is now President of the United States: What’s next?